A sous chef possesses one of the most important roles in a professional kitchen. It is important for any aspiring sous chef to understand the skills required to make a successful career as a sous chef. The word ‘sous’ means ‘under’ in French, indicating that the sous chef is the second-in-command to the head or executive chef. In larger kitchens, there is usually a more extensive hierarchy of chef roles, however, for the majority, the sous chef is one person operating between the head chef and the rest of the kitchen staff. For this reason, the person taking on the role of a sous chef needs to be prepared for what the role entails. 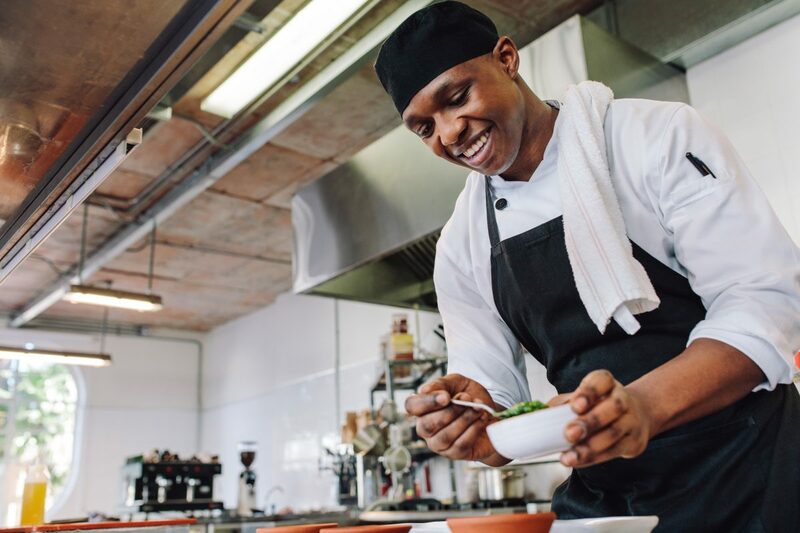 So, if you are interested in pursuing or furthering your career as a sous chef, this blog will give you an insight into the skills necessary to do so! What seems to be an obvious point, but the most vital requirement is being exceptionally skilled in your respected culinary industry. As business innovator Nathan Myhrvold points out, “cooking is an art, but all art requires knowing something about the techniques and materials”. Not only should you have advanced culinary skills in your own field, you should also be prepared to assist other kitchen staff with their roles during busy periods of service etc. A sous chef should always be able and willing to adapt their skill and work together with other staff to provide outstanding cuisine. Often as a sous chef, you will find that responsibilities of organising and planning the menu will fall on you to work alongside the executive chef. The role can also entail overlooking the kitchen supplies and ingredients to ensure the smooth running of these services. The sous chef will also need to keep up with the sanitation standards of the kitchen, making sure they are ready for meal service each day. Scheduling other kitchen employees shifts is another responsibility that is bestowed on the sous chef, as well as making sure that all employees are turning up on time and taking their role seriously. Because of these reasons, a sous chef needs to be a highly organised individual and be able to act with their own initiative. Making your own judgement is a big part of the role; working under pressure is to be expected, being able to handle that pressure to avoid problems is crucial. Although the head chef has ultimate control over the kitchen, the sous chef is still responsible for a hands-on management role. Training employees and supervising them requires a high level of leadership and managerial skills. Confidence is key, it is important to gain respect from your employees within this role. Working alongside staff will show that you are a team player, but you must have a mutual respect and be disciplined with your employees. Even in stressful situations, the sous chef needs to remain composed, professional and in-charge of the situation at all times. Being forthright with instruction along with leading by example will keep staff cooperative and working to the best of their abilities. Following on from the previous leading by example point, being a reliable individual will keep the kitchen running smoothly and service under control. Not only this, but a sous chef must always be competent, loyal and trustworthy. There are a lot of responsibilities that a sous chef has to take on so reliability will be one of the biggest requirements for the role. Commitment to the industry, restaurant and role will be necessary to become a successful sous chef. It is a demanding role, however, the rewards and sense of achievement are far more overwhelming. Becoming an outstanding sous chef is challenging, but if you can master this, you will have the skills and knowledge to potentially become an executive or head chef. If you are looking to forward your culinary career or advance your position as a junior sous chef and you have the skills above, you have every chance to become a successful sous chef! Gateway Hospitality Recruitment lists a variety of the latest hospitality jobs that are available, including junior and sous chef jobs. If you want to begin or further your hospitality career, register your CV with us today and we will contact you as soon as possible! Next Next post: What does each Chef Title mean?